An ongoing debate within the halls of the Federal Reserve and academia centers on whether payday loans make consumers better or worse off. These loans-- secured by a borrower’s next paycheck-- are small ($300 is typical) and short-term (two to four weeks). They come burdened with fees that seem small ($15 to $20 per $100 borrowed) but equate to annual percentage rates of 400 percent or more. And borrowers who can’t repay when their loans first come due will repeatedly roll them over (on average, nine times). The “big question” of consumers’ net gains or losses has now landed on the doorstep of the newly created Consumer Financial Protection Bureau. Twelve states and the District of Columbia have effectively banned payday loans, and the CFPB has the power to restrict them nationwide. Payday lenders (more than 25,000 nationally) and other alternative financial services providers (pawnshops, rent-to-own stores, auto title lenders, etc.) dominate the community financial environment in many low-income urban neighborhoods, especially where racial and ethnic minorities are concentrated. Take Chicago and the adjacent communities of Cook County, for instance. 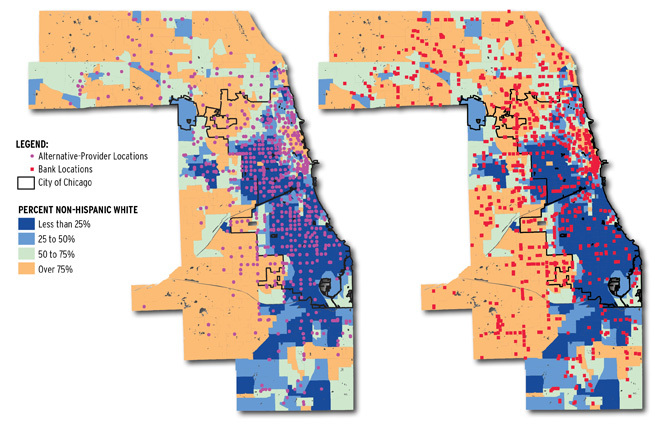 There, as the maps show, alternative providers far outnumber bank branches in minority neighborhoods, while the reverse is true in white neighborhoods. The net effects of payday loans on consumers’ financial health are by no means clear. That’s partly because access to short-term credit (limited for those with low credit scores or thin credit histories) may relieve the financial pain for some consumers, while exacerbating it for others. Also, a handy nearby location isn’t the sole draw for borrowers— mainstream financial institutions (such as banks or credit unions) also dot many poor neighborhoods. All options now compete with on-line lenders, so any regulations aimed at restricting the omnipresence of payday lenders must take that into account. This new fact of life aside, it’s still encouraging that both researchers and policy-makers are looking hard at the community financial environment and its influence on how those with limited options use bank and non-bank financial services. And, happily, this attention mirrors that on the community food environment of low-income households. In both cases, easy access to low-quality products invites myopic decisions. It’s a no-brainer that policies should thus aim to inform choice and improve access to higher-quality products.